File photo Advancing technology and equipment have given farmers new tools to help them throughout growing season. 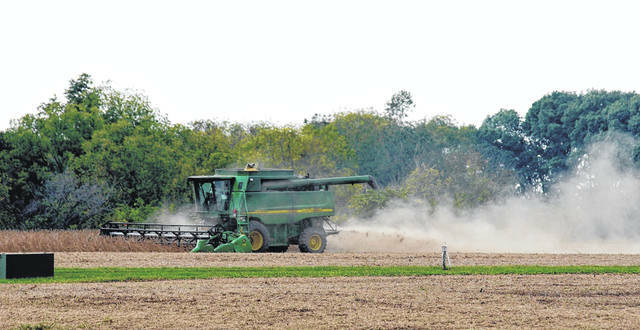 GREENE COUNTY — Advancing technology and equipment have given those in the farming and agriculture field new tools to help them throughout growing season. Corboy said 20 to 30 years ago, farmers neither had yield monitors nor precision planting. Within the last decade, farmers have seen the development of autosteer for grain farming equipment, in addition to the potential unmanned aerial systems could have on the development and implementation of unmanned farm equipment. Corboy said unmanned aerial vehicles or drones can be used by farmers to scout crop fields and more opportunities for their use in agriculture are being discovered. GPS systems, according to Corboy, can be helpful for farmers throughout the growing season. Livestock production has also felt the impact of advancing technology with the use of genomic testing in which producers can decide on new stock based on specific traits and have more specific information about the animals than just visual confirmation alone. “Technology has impacted the livestock industry even the dairy industry with robotic milking,” he said. Corboy added that new technologies are being developed each day in the farming and agriculture industry. “Technology is in all sectors of the growing season,” he said. https://www.xeniagazette.com/wp-content/uploads/sites/32/2019/03/web1_plow2.jpgFile photo Advancing technology and equipment have given farmers new tools to help them throughout growing season.